Think back to your favorite Spielberg movie. How did it open? “Jaws” began with the shark taking its first victim. “Raiders of the Lost Ark” had our hero creeping through the forest towards an unknown bounty. “E.T” started with the titular creature evading the authorities for the first time. “Saving Private Ryan” plunges us into war with the immersive, innovative D-Day sequence. Many chide the director for choosing stories that wrap up neatly and morally, but he certainly knows how to kick things off with a bang. So given this penchant for great beginnings, it feels more than a little disorienting when Spielberg’s latest directorial outing, “The BFG,” opens on a relative whimper. 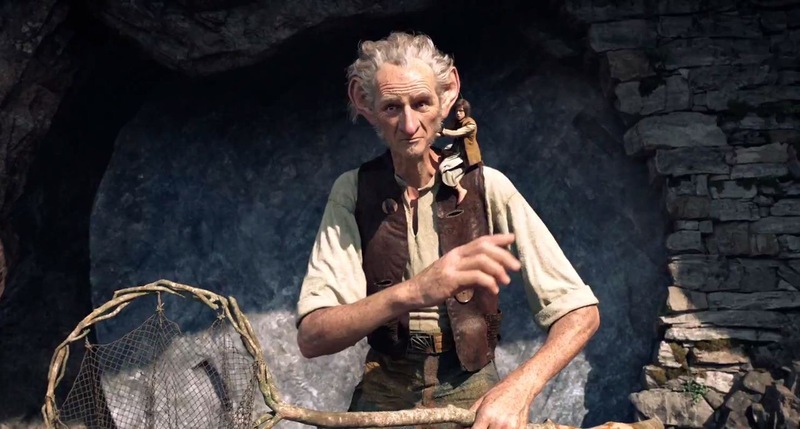 The first fifteen minutes operate as an introduction to our two main characters, young London orphan Sophie (Ruby Barnhill) and the towering “Big Friendly Giant” colloquially known as the BFG (the personage of Mark Rylance). Yet in that period, scarcely nothing comes to light about them. We see that Sophie lurks around her orphanage unhappily in the wee hours of the morning. We can discern that the BFG quietly lurks around the streets of London, performing some unspecified action. It’s likely Sophie has sensed his presence before, and “The BFG” merely begins on the night in which they first make contact. But in order to sell her wonder and fear – or his menace – something else is needed. The first 10 pages of Melissa Matheson’s script might well have slipped out upon delivery to Spielberg. It just does not feel complete. Without this base-level emotional entry point, “The BFG” must be experienced through the events rather than the characters. In this case, that might not be such a good thing. The film is probably Spielberg’s most sparsely plotted work since his first feature gig, 1971’s “Duel” (or, if you really want to dig deep in his archives, the most thinly plotted since the short film that provided the name for his production company, “Amblin'”). Most, if not all, of his movies thrive on a constant forward momentum that propels characters through physical, emotional and supernatural perils. “The BFG” mostly boils down to a spunky young girl exploring a new world with a timid, lovable giant who speaks as if his lines were spat out like a bad Google Translate result. There are plenty of opportunities for joy, laughter and splendor along the journey, however. Spielberg has not taken on a project requiring this much imaginative world-building since “Hook” a quarter century ago, and “The BFG” looks like a release of all the ideas since. This dazzling, vibrant and colorful realm of the giant is ever the visual marvel. But far too much time is spent gallivanting through it just for the sake of taking it all in. Rarely does it ever merely provide the backdrop for the kind of emotional explorations which Spielberg leads so deftly. “The BFG” plays more like a kids’ movie than a family movie. The two are not the same, even though many deploy the phrases interchangeably. Spielberg long excelled at making family movies which both children and adults could enjoy and relate. It’s why so much of his early work endures; films like “E.T.” and “Jurassic Park” provided a level meeting ground on which different generations could share in their fears and aspirations. “The BFG” is a kids’ movie – pretty much just for the youngsters. The film trades in fart gags and crotch hits more than anything else, and with its patiently paced yet thinly plotted build, “The BFG” might not even appeal to them all that much. At 117 minutes, it can be a long sit for a viewer of any age. When Spielberg does get profound, the wisdom only comes from a metatextual level that will likely only be accessible to devotees of the director. The BFG, we find out, deals in dreams. He hunts them down, bottles them up, distills their essence in a beautifully complicated alchemy and then distributes them to children across London. In many ways, the task corresponds quite closely to Spielberg’s own over the past few decades. Except instead of doling out individual visions, though, he provides our collective dreams through his contributions to popular culture.